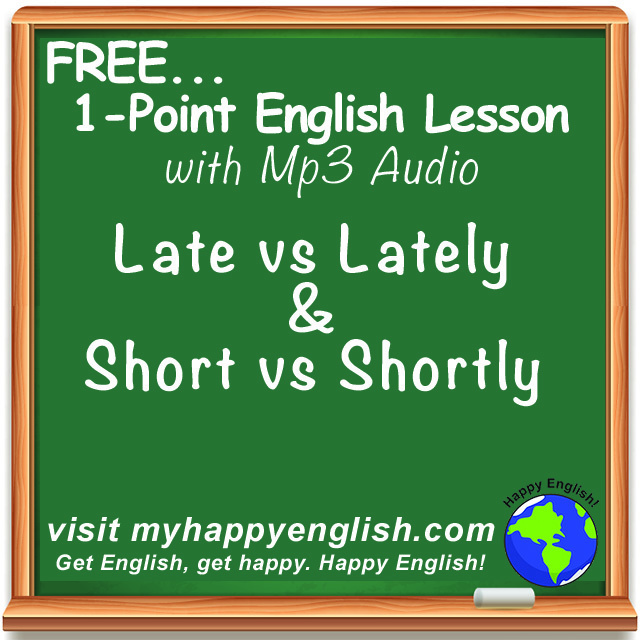 As adjectives, late & short have completely different meanings than their adverb forms, lately & shortly For today’s English lesson, let’s learn how to use these adjectives and adverbs in Everyday English. The trains and busses in NYC are often late. I was late for work today because of the stupid trains again. Don’t be late. The boss will get angry. Lately, the weather has been getting warmer. I haven’t see Jack lately. I guess he’s been busy at work. I haven’t eaten sushi lately. Let’s have it for lunch! I am too short to reach the top shelf. Can you hand me that book? I was surprised that the actor is short. He looks tall on TV. This USB cable is short, so I need to move the printer closer to the PC. I’ll be finished with this phone call shortly and then we can chat. The taxi should be here shortly, so put on your jacket and get ready. Here is your table. The waiter will be with you shortly.